Sparks Group is a national employment agency that excels in placing talent in a variety of positions in the Accounting & Finance, Government, Human Resources, IT, Marketing, and Office/Administrative industries. For hiring managers and Human Resource (HR) departments, finding skilled, experienced, and dedicated candidates can quickly become a tedious process. Reviewing countless job applications, vetting resumes, scheduling interviews, and following up with candidates can become monotonous and take up valuable resources. While these tasks are tedious, it’s vital that HR departments and hiring managers spend the proper time throughout the hiring process to ensure they’re hiring candidates who have the appropriate skills and experience to excel in the potential role, while also being a good company culture fit to reduce turnover in the long run. Employment agencies take the burden out of the hiring process. Recruitment experts, like Sparks Group, have their vetting process to place candidates based on an employer’s desired qualifications for a specific role. These steps ultimately save companies money and resources to help better focus efforts on internal company initiatives. There are benefits for both employers and prospective employees who proceed with their job search through employment agencies. Employers save money on the initial vetting of potential new hires without having to pause any ongoing projects or initiatives. 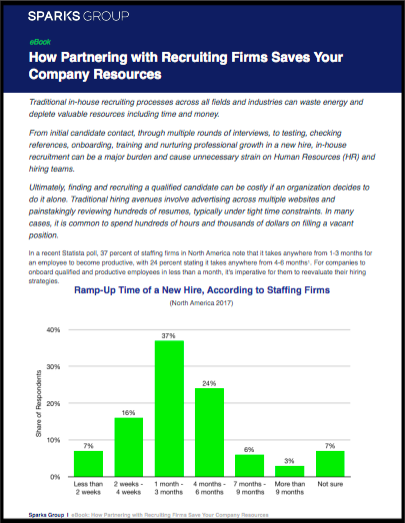 Staffing agencies also offer specialized services dependent on the role such as executive recruiting, personnel placement, or even staffing for part-time or temporary positions. Candidates are guided through the job placement process step by step, knowing that their recruiter is looking out for the career goals of job seekers and finding the best fit for their skills and talent. View Open Positions on Our Jobs Board. Sparks Group is a full-service staffing and recruiting firm that understands the core values integral to a growing business when helping companies find talent to join their team. We specialize in rapidly placing quality talent by cultivating relationships with diverse industries and companies. Our team of recruiting experts use a personalized approach to help employers and employees find a successful match in finding a highly-qualified candidate that is the right culture fit for an organization. To learn more about how Sparks Group can accelerate your hiring initiatives and match your open positions with the most qualified candidates, complete our form and schedule a free consultation with one of our hiring professionals today.